Golf carts are a great way to get from one point to another quickly and efficiently. They are typically very energy efficient and are perfect for golf courses, country clubs, and other gated communities. However, many of you may want to upgrade your golf cart’s top speed. The process is straightforward and can be accomplished fairly easily. This article provides seven tips to upgrade your golf cart speed while keeping it street legal. The first step you should take to increase your golf cart’s top speed is to install a more powerful motor. The reason is that the motor plays the most important role in determining your golf cart’s top speed. More specifically, the motor is the key element that determines the amount of total voltage available and the maximum potential rotations per minute. No matter how much juice you apply to a golf cart, you have to make sure the motor has the capacity to handle the increased speed you are attempting to achieve. When shopping for a new motor, pay careful attention to the total voltage it can create as well as the maximum rotations per minute that it can put out. Generally speaking, more rotations per minute directly equates to higher overall speed potential. The next step to take when trying to increase your golf cart’s top speed is to ensure that your golf cart holds the correct amount of charge necessary to operate correctly. 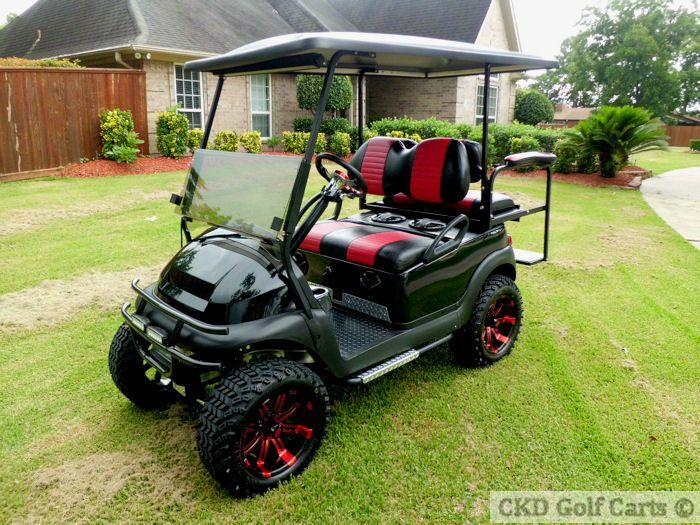 Golf carts typically come with batteries that are designed to provide just the right amount of power necessary to power them based on their size and the motor type. When you upgrade to a more powerful motor, you often have to purchase a larger battery that is suitable for the increased drain on the motor. Golf cart batteries typically come in three different voltages: 6, 8, and 12 volts. Consult your new motor’s instructions to find the correct voltage and number of batteries you need to power your golf cart. Another step that is crucial to increasing the overall top speed of your golf cart is to check your solenoid contactor relay. The solenoid contactor relay is a critical component of any golf cart and is responsible for allowing the electrical component to flow directly to the motor. Unlike equivalent pieces of equipment in automobiles, the solenoid contactor relay activates and deactivates every single time you start and stop your golf cart. Solenoid contact relays typically support a certain amount of amps. Whenever you are upgrading the electrical components of your golf cart, you have to make sure your solenoid contactor relay can support the higher amps created by your motor. Otherwise, you won’t notice a speed increase. One of the next steps to consider is replacing your speed controller. As the name implies, the speed controller is responsible for allowing golf cart drivers to control the speed of their vehicle. It is one of the primary reasons your golf cart starts off at a nice slow speed before progressing to a higher velocity. Any time you decide to upgrade your motor and other electrical equipment in your golf cart, you should consider upgrading your speed controller as well. The last component of your electrical system that you should potentially upgrade when trying to improve your golf cart’s top speed is the wiring. Wiring is categorized by a special number known as AWG (American Wire Gauge). The larger the number, the smaller the diameter of the electrical cable. The size of cable you’ll need is typically determined by the amperage of your motor speed controller. You can find this information on the product details section of your product packaging. It is important to upgrade your wiring to ensure that it can handle the increased electrical load that your components require. This applies to all the large cables going from the multiple components like the battery, controller, and other areas. Any section that is not appropriately upgraded can create a bottleneck in terms of power transfer. Believe it or not, the size of your tires has a direct impact on your overall golf cart’s top speed. The reason behind this is that a larger tire is able to travel further with each rotation. This is due to the tire’s increased surface area. One of the most common sizes for golf cart tires is 18 inches. You can gain as much as 3 miles per hour by upgrading to 22-inch tires. Before you make this upgrade, however, ensure that your newly installed engine and upgraded electrical system have enough power to turn your new tires effectively. You can often find important information like this in the user manual that comes with your newly purchased equipment. While it may be easy to forget the brakes when trying to improve your golf cart’s top speed, don’t. It is an important part of the upgrade process that helps ensure your golf cart remains street legal and safe. The majority of brakes have enough stopping power for slower speeds. However, if you increase the top speed of your golf cart, consider looking for more powerful brakes that support greater stopping power. A great idea is upgrading to all wheel brakes in order to decrease the total stopping distance of your golf cart. With these seven tips, you should be able to increase your golf cart’s top speed. Start with your motor and work your way from there to ensure all the key components of your golf cart are maximized for speed while remaining street legal.